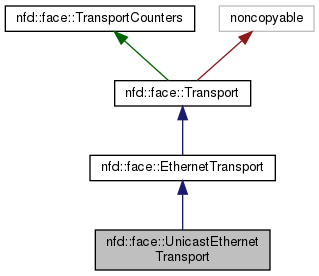 A unicast Transport that uses raw Ethernet II frames. Definition at line 38 of file unicast-ethernet-transport.hpp. Creates an Ethernet-based transport for unicast communication. Definition at line 35 of file unicast-ethernet-transport.cpp. References ndn::ethernet::ETHERTYPE_NDN, ndn::nfd::FACE_PERSISTENCY_ON_DEMAND, ndn::nfd::FACE_SCOPE_NON_LOCAL, ndn::FaceUri::fromDev(), ndn::net::NetworkInterface::getMtu(), nfd::face::Transport::getPersistency(), ndn::nfd::LINK_TYPE_POINT_TO_POINT, nfd::face::EthernetTransport::m_destAddress, nfd::face::EthernetTransport::m_interfaceName, nfd::face::EthernetTransport::m_pcap, nfd::face::EthernetTransport::m_srcAddress, NFD_LOG_FACE_INFO, nfd::face::Transport::setLinkType(), nfd::face::Transport::setLocalUri(), nfd::face::Transport::setMtu(), nfd::face::PcapHelper::setPacketFilter(), nfd::face::Transport::setPersistency(), nfd::face::Transport::setRemoteUri(), nfd::face::Transport::setScope(), and ndn::ethernet::Address::toString(). Definition at line 77 of file unicast-ethernet-transport.cpp. Definition at line 83 of file unicast-ethernet-transport.cpp.